Music has always played a key role in our society, and it has been used to tell stories for thousands of years. As we have evolved, so have the ways in which we listen to music, and ceiling speakers are some of the latest forms of tech on the scene. Looking to put a little “wow” into your next party? A set of ceiling speakers could be just what you need. Of course, there are quite a few models and brands on the market, and that can make it hard to choose. In order to help you find the best ceiling speakers, we have put this guide together, compiling all of the relevant ceiling speaker reviews in one place, so you can find something to bring your party to life. Essentially, ceiling speakers have been designed to sit recessed into the ceiling. In fact, their clear audio quality has made them a popular choice for residential homes – both to alert the staff and play music. They tend to offer a sleek and minimalistic look to your home as well, saving space while also providing a modern entertainment system for any guests you might have. They work the same way as normal speakers do, the only real difference is that there are mounted to the ceiling. Plus, there is no visible wiring as they are run from a unit behind the wall, so they leave you with a tidier and more aesthetically pleasing appearance. They often come in square or round shapes, and the grill can be painted to match the ceiling, allowing them to blend in with the décor. Now that you have a little more information on how everything works, take a look at the ceiling speaker reviews below. Bose is one of the leading brands when it comes to speakers and audio systems. They are masters of their craft, and you really cannot go wrong with anything that they create. Take some time to read the reviews below and see if this is what you need for your music. 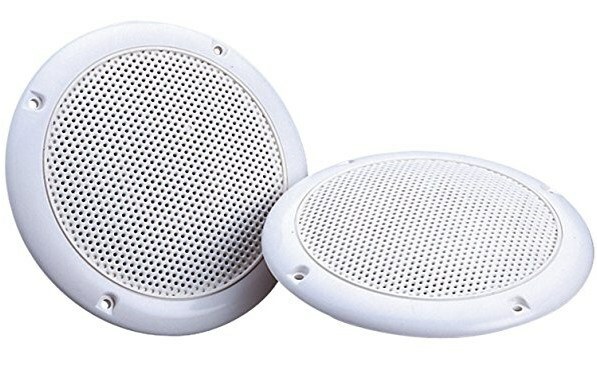 This ceiling speaker comes with a white grill, so if it does not already match the colour of your ceiling, you can change or paint it to do so. It blends seamlessly into the room, becoming virtually invisible. It uses standard dogleg clasps and magnetically attached grilles to make the installation process one that is fast and easy, so you won’t need a professional to come and do it for you. Each of the speakers has a seven-inch woofer as well as two tweeters that have been strategically placed for the best possible results. It covers the room with a balanced stereo sound, and you can rest assured that there are no drop-offs. High-quality and with a full range performance, you won’t go back to normal speakers after this. There have been no issues with this product so far, although some find it to be a little expensive. The price might be a little high, but this ceiling speaker is worth every penny. Not only does it come from a very reputable and reliable brand, but it also produces excellent sound quality that will fill the room without any drop-offs – so you can enjoy perfection from your music. It’s the ideal speaker for a relaxing afternoon, and it blends in perfectly with your home. An absolute must for any music lover. Q: In the description it says black. in the pictures the cover looks white. which one is it? 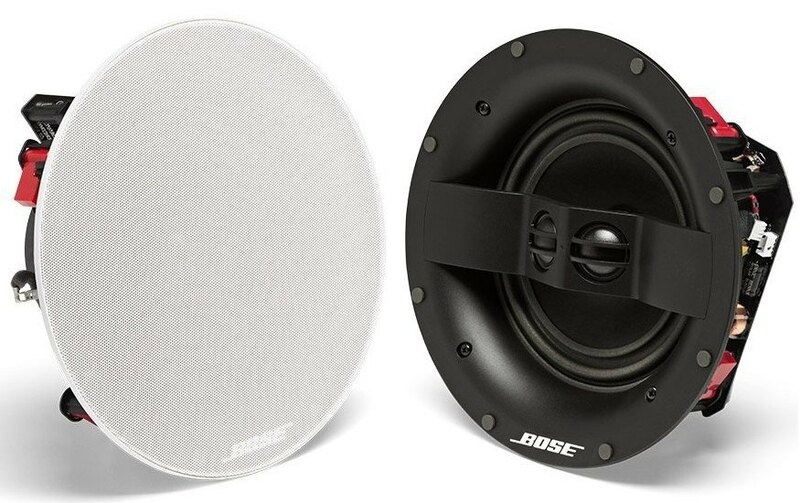 A: The Bose Virtually Invisible 791 In-Ceiling Speaker II are a black speaker and ships with white grills. 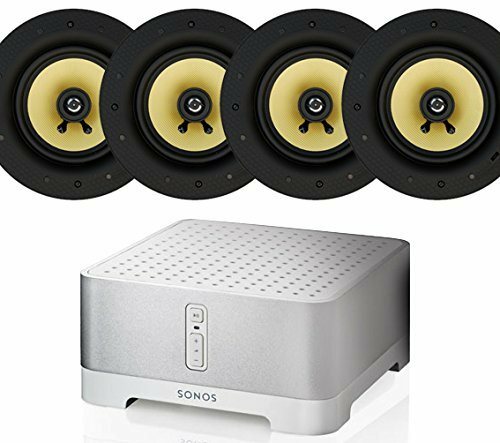 In the big scheme of things, Sonos is relatively new to the audio scene. However, they have already developed some of the best and most impressive pieces of kit around. Have a look at their ceiling speakers to see if this is what you want for beautiful surround sound in your home. The amazing thing about this package is that you get four speakers and an amp for your home, so you can really make the most of your music. The installation process is simple and discreet, so you won’t need a professional, and they come with a white grill to blend in with your ceiling. Although, this can be painted if it does not quite match. It features a superb quality bass driver that will deliver a heavy and throbbing bass throughout your home, and the 18oz magnet promises perfect surround sound that will leave you wanting more. The titanium dome tweeter provides precision, and the low-frequency response means that you won’t end up with feedback – so you can just enjoy crystal clear sound. It is true that this is the most expensive ceiling speaker that we have listed here, but when you think about what it comes with, the price is much more reasonable. The four speakers and amp mean that you can really benefit from a surreal and surround listening experience, and one that will leave you never wanting to try anything else again. It offers perfection when it comes to sound, and you won’t want to miss out on this amazing product. Polk is another great brand, and one that produces some really nifty tech for your home. This ceiling speaker is perfect for producing a little atmos in the home when you need it most. Have a read of the reviews below to see if this is the right speaker for you. This ceiling speaker has a really cool and unique design, as it was made to be very discreet and take on the appearance of a light fixture – so it blends in without calling attention. It does come with a white grill as well, which can be painted to match your ceiling. Installation is easy and quick, so you don’t need an expert to come and do it for you. These speakers promise to give you an unrivalled quality of sound, and one that will leave you feeling incredibly impressed. It contains a tweeter for excellent sound precision, as well as mid-woofer. With all of this, you can expect to create the atmosphere you want, and have your home feeling just the way it should. There is no bass, which some customers found to be disappointing. 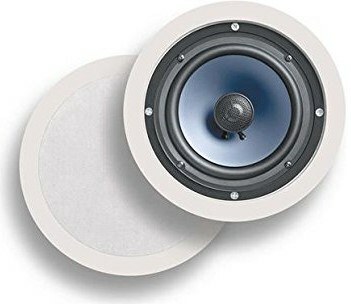 This ceiling speaker comes at an affordable price, and is one of the cheapest models we have listed here. While there is no bass, it can still offer so much and help to create the perfect atmosphere within your home. With a sleek and discreet design as well as an amazing quality of sound, they are worth trying just for the fantastic experience. This speaker comes in a classic white, so it is sure to blend in beautifully with most ceilings. Plus, you can even install them on the walls if you feel like it, so there is some added versatility to this set. It is also resistant to moisture, which makes it great for installing in rooms such as the bathroom, or even for potential use in a spa. From a trusted and reliable brand, this ceiling speaker comes at a very reasonable and affordable price. In this set, you get two ceiling speakers, which makes them seriously great value for money. 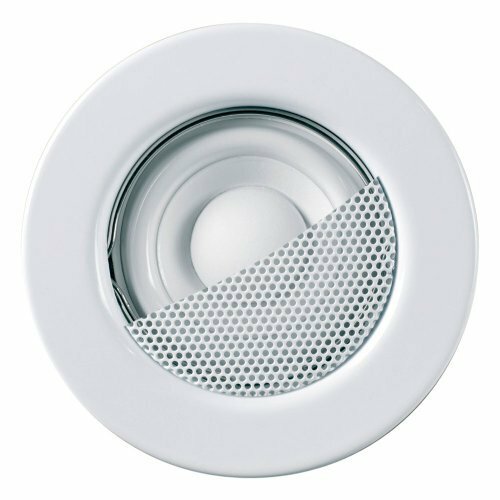 These dual cone ceiling speakers are resistant to moisture, so they can be installed in any room without fear of damage from things like steam or accidental exposure to a little water that has been flicked from the bath or shower. Through all of this, they retain superb audio quality, so you can sit back and relax while you listen to your favourite music. Hopefully, this guide has helped you to find the best ceiling speakers, so you can prepare for your next party, or maybe just install them for your own use to keep them out of the way. Whatever your intended purpose for them, we are sure that one of the models here was just right for you. With a selection of top brands and some great prices, there is a ceiling speaker here for everyone. Whether you want surround sound or a little bit of atmosphere, they can provide you with just what you were in search of. We hope this guide helped you to find something perfect. 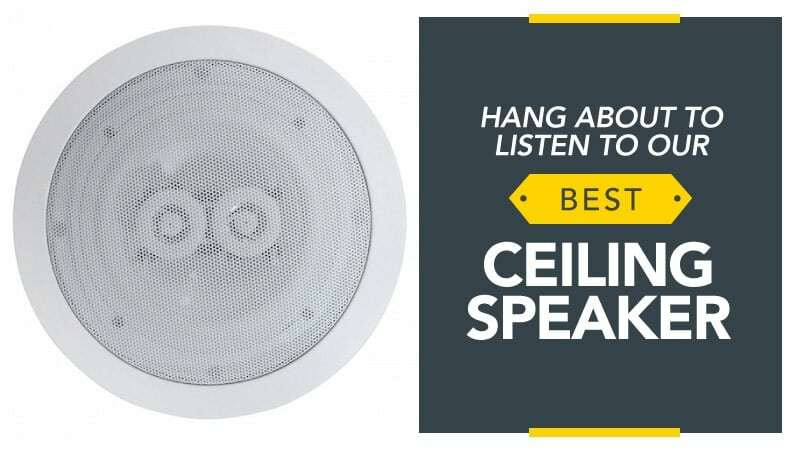 What did you think of our ceiling speaker guide? Are there any that you would have liked to see or recommended?